A Medium Size, Thin, Very Well Made, Tang Knife That Exhibits Surface Sheen And Stone Aging Coloration Patina, Correct Style Flaking, Correct Blade Sharpening Reduction, Mineral Deposits, Visible Surface River Polish,Correct Style Of Flaking, Correct Type Material & Manufacture For The Area Found. Found By Olen Taylor, On The Arkansas River In Tulsa County, Oklahoma. 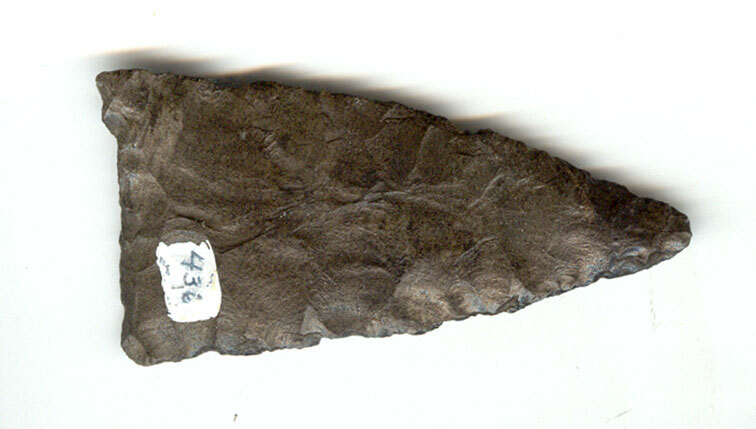 This Example Was Possibly Attached To The Side Or Wrist By The Tang And Used As A Late Period Skinning Knife! Includes Dwain Rogers ( As A Hopewell Knife ) And Ken Partain Certificates Of Authenticity!